Julian Schnabel was born in New York in 1951 and studied at the University of Texas (1969-73) and the Whitney Museum Independent Study Program (1973-74). He lives in New York and San Sebastian, Spain. Historically it is related to the American Neo-expression, with a later evolution towards Conceptualism and Minimalism. 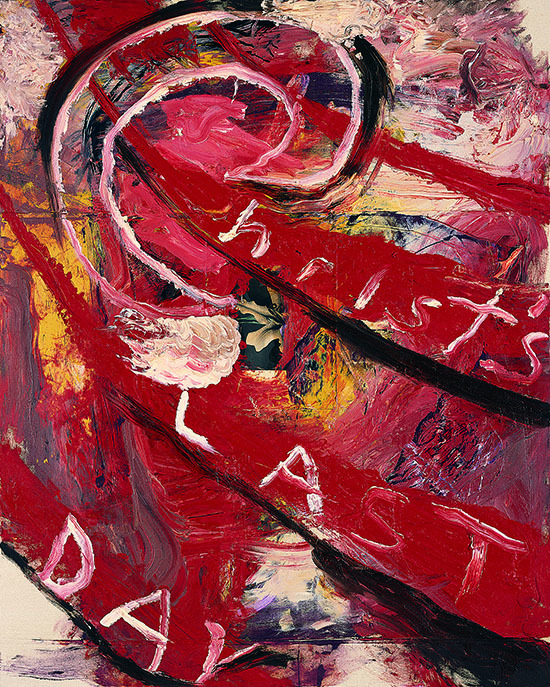 Julian Schnabel's painting gravitates around concepts such as obsession, sexuality, death, redemption and faith. Christ's last day is a transcendental vision of the relationship between art and life, where the canvas has to do with anthropomorphic elements: the vision of the human body from the inside. His first major exhibition was at the Contemporary Arts Museum, Houston, in 1975. Since then, his work has been shown all over the world including Inverleith House (2003); Schirn Kunsthalle Frankfurt and Museo Nacional Centro de Arte Reina Sofia, Madrid (both 2004); Mostra d'Oltramare, Naples (2005); Schloss Derneburg, Germany, Tabacalera Donostia, San Sebastian, and The Beijing World Art Museum, China (all 2007). His work is included in major international museums and private collections, such as the Metropolitan Museum of Art; the Museum of Modern Art; the Whitney Museum of American Art; the Museum of Contemporary Art and the Broad Art Foundation, Los Angeles; Reina Sofia, Madrid, and the Centre Georges Pompidou, Paris.